It is generally forecasted that temperature will rise in the arctic region as a result of global climate changes. This rise in temperature will significantly change the living conditions for all inhabitants of this region, humans and other living creatures. Also this region will become more accessible by sea as ice and snow coverage will decrease. 1. Climate change will probably lead to more rapid warming of the Arctic in comparison with the rest of the world. As a consequence, Arctic waters will warm more rapidly as well. 2. Climate change will lead to substantial reductions of Arctic sea ice coverage and thickness. 3. It will likely lead to reduced salinity due to influx of fresh water from melting sea and glacial ice. 4. Increasing acidification of the world’s oceans due to increasing uptake of CO2 (which is not just relevant to the Arctic marine area). However, on the whole the far north is supposed to benefit from this northward movement of species. With the exception of northern shrimp and Greenland halibut very few high northern species are very valuable or abundant. On the other hand many subarctic stocks are very abundant and valuable. 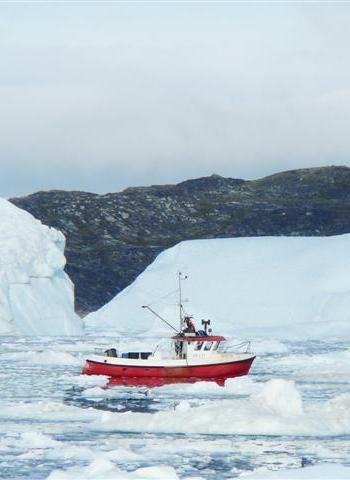 Atlantic cod, Atlantic herring, haddock, Pacific halibut, red king crab and sockeye salmon are subarctic, are among the most valuable species in the world and all are moving further north. It is therefore important for the people of the high north to be ready if the traditional species that were harvested move away and new ones arrive instead. Some change in fisheries technologies will be needed, but that does not pose a great threat as humans are very adaptable. In many cases the temperature might not affect the species directly but rather indirectly. On species might move away due to unsuitable temperatures to spawning. Other species that depend on that species as prey will then suffer. No matter if they in fact do tolerate the temperature change itself. Example of this might be the strong relationship between cod as predator and capelin as prey. The opposite can also happen, an animal might suddenly find that it is sharing the habitat with a new predator with warming climate. Examples of this is the relationship between Northern shrimp as prey and cod as predator Similar can happen with diseases, warmer waters generally bring more diseases that cold water animals might not be able to survive. The cold water prey or host species might thus suffer from warming climate although the temperature increase itself is not the enemy, it is what it brings along.